CULT TV FLASHBACK #74: Battlestar Galactica: "The Man with Nine Lives"
Yet today, I was in the mood for something a little lighter; a little bit more fun…and I struck again on one of the installments I have enjoyed so much over the years: “The Man with Nine Lives” starring the late, great Fred Astaire (1899-1987). The episode originally aired January 28, 1979…over thirty years ago. Now first off, I’m a huge fan of the classy Astaire, and I count Top Hat (1935) and Swing Time (1936) as two of my most beloved movies of the 1930s (alongside such titles as Things to Come, Bride of Frankenstein, King Kong and Dracula). But secondl y, this episode of Battlestar Galactica, written by Donald Bellisario, remains a real series highlight, thanks to some clever writing, some good character dynamics involving Starbuck, and the inclusion of a new (and strange) series villain: The Borellian Nomen. Those aliens provided the Galactica with the coordinates to planet Earth, and now the Colonials — for the first time since their exodus — are beginning to express real hope that their odyssey will soon be at a happy end. The warriors of Blue Squadron are sent on a weekend “furlon” to the Rising Star, where Starbuck (Dirk Benedict) tests a new gambling system that he considers “foolproof” (and oddly, he is allowed to actually use a computerized-calculating device at the casino gambling tables…). At the same time, however, a mystery man named Captain Dmitri (Astaire) is also aboard the Rising Star, attempting to escape the wrath of three Borellian Nomen on a “blood hunt.” It seems Dmitri double-crossed these fearsome men on a live-stock deal and in the process learned that the separatist Nomen were hording weapons and foods for a pitched battle with the fleet. “The Man with Nine Lives” offers a lot of good material for this spectacular Glen Larson series, from a Galactica Recruitment Commercial starring Omega (“We Need You!”), to welcome details about Starbuck’s mostly-unexcavated youth. In particular, we learn how — after an early Cylon attack — a young Starbuck was found wandering in the Thorn Forest near the agro-community of Umbra. Even better, the Borellian Nomen make satisfying and creepy villains in this episode (and they also re-appear, to good effect in “Baltar’s Escape”). These strange humanoids — who don’t often mix with the Colonials — are heavy-browed ascetics who physically resemble, well, Neanderthals. The Nomen imply, by their very costume and appearance, that the 12 Colonies of Man were not “uniform” in population or ethnicity; that there were strange sects and off-shoots that also survived the devastating Cylon attack. Also, these “fringe” Nomen resemble some of the weirder extremist militia groups we’ve seen sprout up over the years in America. In particular, they are paranoid and suspicious about the central government and rather…uh…survivalist in nature…preparing for an eventual final war with the establishment. Another point: The Nomen also live by “The Code,” a strict doctrine of “honor” that champions discipline, preparedness (it’s against the code to be unarmed…), and patience (the patience of the “Scorpius, in fact…”). Those who break the Nomen Code see their ceremonial sashes stripped from them, and their names stricken from “the Code of the Nomen” for all time. Now before you stop and say, “Hey, that description sounds just like the Klingons,” remember your Star Trek history. Before Star Trek: The Motion Picture in December 1979, Klingons were actually just swarthy human-looking aliens with bad manners (and no heavy brows or bumpy forehead ridges…). These original Klingons boasted no sense of honor whatsoever. They loved war (“it would have been glorious!”), and they believed that rules were made to be broken. So it wasn’t actually until The Motion Picture, and then The Next Generation in the late 1980s and early 1990s (and after “The Man with Nine Lives”) that the Klingons mysteriously transformed into the now-familiar “honorable” race we associate with Worf and others. So Battlestar Galactica wasn’t ripping off Star Trek with these colorful and interesting Borellian Nomen. I thought that might be worth mentioning for those who don’t have a good familiarity with the original Battlestar. The only aspect of “The Man with Nine Lives” that rings false is Starbuck’s extreme sense of indignation over Apollo’s decision to run a security check on Chameleon behind Starbuck’s back. I can understand being angry, but Starbuck basically terminates the friendship, when it’s pretty clear that Apollo’s intentions are sincere…and arise from a desire to protect, not harm, his friend. Overall, “The Man with Nine Lives” is also tremendous of fun because Astaire proves so utterly charming and affable as the scoundrel, Chameleon — a real rascal who boasts Starbuck’s way with the ladies, not to mention the gift of gab. This entry was posted in Battlestar Galactica, cult tv flashback. Bookmark the permalink. I love, love, LOVE this show. Yet, I don’t remember this episode. I have the boxset and haven’t really dove into it yet, so I’ll have to watch this. This is my favorite of the one-hour Battlestar episodes. As you point out, John, it adds a lot of depth to Starbuck’s character and to the overall world of the show with the Nomen, the recruiting program, and even Lt. Jolly (who as I recall is the only warrior on the Rising Star who knows much about Nomen culture). The laser-bolo weapons are unique and cool-looking, and Astaire and Dirk Benedict had terrific chemistry. It’s a shame Chameleon didn’t have a chance for an encore. The final scene, where Chameleon asks Cassopeia to conceal the genetic-test results for Starbuck’s own good, never fails to choke me up a little. So great to read an enthusiastic review of an episode from the original Battlestar Galactica. And you picked a great episode to review, too. I love this one, for all the reasons you cite. >Astaire also played another famous father, that of Alexander Mundy of It Takes A Thief. One of the best episodes of the original Battlestar Galactica. Which goes to prove that the original will always be better than Galactica 1980 and the 2003 remake. 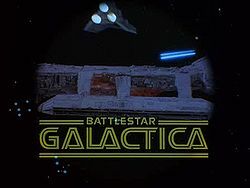 With a little creativity, ingenuity, and well written stories,the original Battlestar Galactica is a fine example of excellent science fiction and fanatsy, as well as excellent-quality family programming. I wish that today's shows were more like this than the dreck that is being shown on television now. I thought the same thing upon seeing the episode re. Starbuck’s weird reaction. Considering all he and Apollo have gone through prior to this ep, his reaction seems out of character and a bit contrived.